This trail circumnavigates Stryker Lake and offers gorgeous views of the lake. Marked by the Yellow Shield "Lake Loop" blazes, the trail is wide and mostly easy but poses a few short climbs, fast descents and other challenges. The trail stars from the south parking lot and winds through the seven fingers while overlapping the Perimeter Trail. The Lake Loop then makes a sharp right at the Middle Entry gantry, and flows along curving trail. Upon passing a memorial to the right, the trail makes a left and then a right continuing to meander through the woods. Riders come upon a short climb and quick descent. The Lake Loop overlaps the Perimeter Trail at this point. At a stand of pine trees, the Perimeter Trail cuts off to the left and the Lake Loop continues straight. A fast descent brings riders to an intersection where Lake Loop riders will stay to the right, the Lake Loop stays to the right at a second intersection shortly thereafter. Riders encounter a steep climb and are rewarded with rolling, flowing track thereafter. Coming to a T intersection at the Advanced Trails Access, riders will bear right to stay on the Lake Loop. The trail flows mostly downhill for the next 1/2 mile and at the end circumnavigates a small pond. After a sharp turn right, riders climb some short hills and then begin a descent curving to the left. The trail flows relatively straight south and riders will make a sharp right to follow Lake Loop near the edge of the lake. This section of the trail meanders back and forth and offers some of the best views of Stryker Lake. At the southernmost part of the lake, riders bear right and the Lake Loop again overlaps the Perimeter Trail until returning to the south parking lot and completing the Lake Loop. Review: This trail is awesome with great views of the lake. It is beginner, but some uphill and downhill sections will push the beginners to get better! Most of the trail utilizes existing ATV trails and there are some pretty rough root sections. Overall it is a nice ride and has some very sweet sections. It does share a section with the Perimeter trail through the fingers. 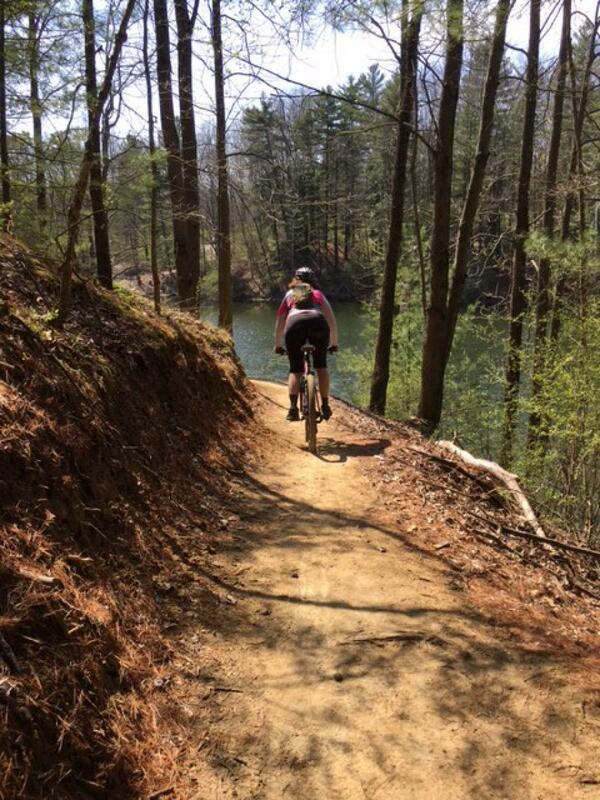 Review: Fun trail with great views of the lake. Review: Trails were fast and Fun We arrived on Sunday at about 11 AM I was surprised we were the only riders there. This place is an epic gem must ride all the trails there, and spend some time in the skills park. You could spend a whole day here. Review: This beginner loop has great views of Stryker Lake. There's a mix of flows track and some slightly more challenging sections that roll with the terrain. Lake Loop MTB Trail 5.00 out of 5 based on 4 ratings. 4 user reviews.